-- In sketching out a potential path to a bare Democratic House majority of 218 seats out of 435, we found that in all likelihood the Democrats will need to win similar numbers of Republican-held seats won by Hillary Clinton as well as by Donald Trump in the last presidential election. Clinton-won districts are not enough on their own. -- It is hard to construct a Democratic majority without the party netting several seats from California, and Democrats also likely need to win at least multiple seats apiece in New Jersey, New York, and Pennsylvania, where a new district map may be in the offing. -- The growing number of Republican-held open seats may allow the Democrats to net a third or more of the seats they need to win the House from districts that don't have an incumbent. But as we've previously said, the majority of Democratic gains will have to come from beating incumbents, unless considerably more Republican incumbents retire from vulnerable seats. 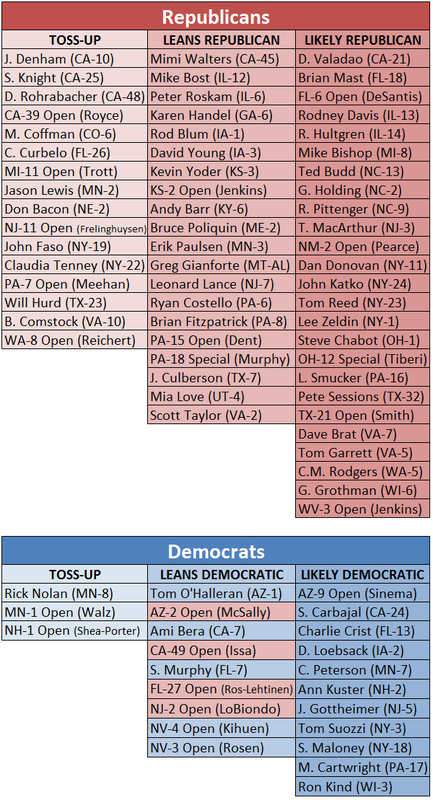 Since we wrote an overview of open seats two weeks ago 1, two more swing district Republicans announced their retirements: Reps. Rodney Frelinghuysen (R, NJ-11) and Pat Meehan (R, PA-7). -- A caveat: What follows is NOT a projection. We are not making many specific House calls nine months before the election, and our own belief is that, as of this moment, the race for House control is about a coin flip. Democrats should gain seats, but on the face of the seats currently available to flip, we're unsure if they can net the 24 seats they need to win control. A look at the specific targets might help explain our reticence in prematurely declaring the House for the Democrats despite clearly favorable national conditions. A tsunami might well develop in the fall, but that's a judgment that cannot be reached with the information we have today. We've previously described the Democrats' odds of winning a House majority in November as roughly 50-50 2, and that's where we remain. Democrats benefit from the usual presidential party midterm drag, President Trump's lackluster approval ratings, and a flood of candidates. Republicans benefit from the overall House map and the presence of some strong incumbents in marginal districts, even after some key retirements have weakened the front line of their defenses. But if one believes the Democrats have a clear if challenging road to 218 (or more) seats in the House, as we do, one has to also construct a seat-by-seat path to how they might win that majority. That's what we're going to do today. We're going to call this the Democrats' “Drive for 25.” Perceptive readers may recall hearing that phrase before: It was the Democratic slogan in 2012 3, when the Democrats needed to net 25 seats to win back the House after they lost it in the Republican wave of 2010. (They only netted eight, so Democrats hope the sequel is a lot better than the original.) This path is based on the assumption that Democrats need to win at least 25 current Republican seats to capture the House. Technically, the Democrats only need to net 24, assuming a full strength House featuring a roster of 241 Republicans and 194 Democrats (at present, there are three Republican vacancies that will be filled in special elections later this year -- it's possible the Democrats can pull an upset in one or more of these seats, but let's assume for now that they don't; there's also a Democratic vacancy, MI-13, that won't be filled until the regular election). However, even in bad years for the presidential party, that party usually wins at least something from the other party. So for the purposes of this exercise, we're assuming the Republicans win one, but only one, Democratic-held seat. The best candidate is MN-1, an open seat in southern Minnesota that Trump carried by about 15 points. Assuming that, the Democrats need to capture at least 25 current Republican seats. What follows is something of a “choose your own adventure” featuring a Democratic path to a bare majority through buckets of different kinds of seats. Obviously, if Democrats were to do a little bit better in one basket, they could make up for a deficit in another grouping (and vice versa). We recently published a detailed analysis 4 of all of the open seats in the House as of a couple of weeks ago, and these four stood out to us as the likeliest Democratic takeovers. Hillary Clinton won three of the four, and according to our friend Scott Crass 5, the presidential party has not successfully defended an open seat won by the other party's most recent presidential nominee in a midterm since 1990. Additionally, we see Trump-won NJ-2 as a good Democratic opportunity because of the candidacy of state Sen. Jeff Van Drew (D) coupled with the Republicans' inability (thus far) to find a top-tier candidate as they seek to replace the retiring Rep. Frank LoBiondo (R, NJ-2) 6, a relative moderate who enjoyed labor support since his initial election in 1994. Here are two more Clinton-won open seats (CA-39, WA-8) as well as two Trump-won seats where the president ran a bit behind Mitt Romney's 2012 showing (MI-11 and NJ-11). Picking up three of these four would get the Democrats to the open-seat goal we set for them two weeks ago: netting at least half a dozen seats from the total number of open seats (50 as of Wednesday afternoon), again assuming that the Democrats lose one of the open seats they are defending (MN-1 in this scenario). The Democrats may be able to net even more than a half-dozen open seats (some others are addressed below). Seats: PA-6 (Ryan Costello), PA-7 (Open), PA-8 (Brian Fitzpatrick), PA-15 (Open), and/or ? The Keystone State sits in limbo as we await a potential remap ordered by the state Supreme Court. It is unclear how much a new district map would benefit Democrats. The map as currently drawn is a fairly obvious Republican gerrymander: The Republicans control 13 of 18 seats in a state that was about 50-50 at the federal level in 2016 (and was more Democratic-leaning before that). Assuming that the remap isn't delayed -- the U.S. Supreme Court could still intervene and allow the old map to remain in effect for 2018 7 -- Gov. Tom Wolf (D-PA) and the Republican-controlled state legislature will have to agree to a new map, or the courts may draw a map. Speculating on what might happen is largely guesswork, but one of the wrinkles of the court's order is that it wants to limit the splitting of counties. PA-7, currently held by retiring Rep. Pat Meehan (R), probably would become a Democratic-leaning seat under a remap 8. Meehan's current seat is a gerrymandered atrocity 9 that was designed to ensure his reelection after his initial 2010 victory, and it did over the succeeding three elections even though the district actually voted for Clinton in 2016. Meehan was likely in for a hard race anyway, and recent news of his sexual harassment of a staffer only compounded his problems, leading to his retirement. The seat is now a Toss-up under the current lines, and the district could essentially become a Safe Democratic seat if it is dramatically redrawn as a district dominated by Delaware County (Clinton won that county by 22 points, and by itself it has roughly three-quarters of the total population required for a congressional seat). In other words, PA-7 in its current form, or in a different form, is probably something of a must-win for Democrats now that it is an open seat, and it may become the likeliest Democratic pickup in the country depending on the new map. According to our ratings (based on the current map), Democrats have five additional targets in Pennsylvania: Costello (PA-6) and Fitzpatrick (PA-8), who hold swingy Philadelphia-area seats that may or may not change significantly in redistricting (Fitzpatrick's may not change much at all given that it is already compactly situated in Bucks County); the Republican-leaning open seat held by retiring Rep. Charlie Dent (R, PA-15); PA-18, a vacant and heavily Republican seat holding a seemingly competitive special election next month; and a Lancaster County-centered seat held by Rep. Lloyd Smucker (R, PA-16). In all likelihood, the redistricting will scramble this list of Democratic targets; it's also possible that a new map will imperil Rep. Matt Cartwright (D, PA-17), who holds a northeastern seat initially drawn as a Democratic vote sink that Trump nonetheless won by 10 points in 2016. Realistically, under old lines or the likely new lines, the Democrats probably need to net three seats out of Pennsylvania to make the math work elsewhere. PA-7 is the clearest target, both because it is an open seat and because it could become much more Democratic in redistricting; the rest is a question mark. Democrats already hold 39 of 53 districts in California, and yet they likely need to squeeze several more seats out of the Golden State to get to a House majority. Two California districts, CA-39 and CA-49, are already listed above because they are open seats, but there are at least five other incumbent-held Republican seats that Democrats will target in California. Democrats came close to beating Denham (CA-10) and Knight (CA-25) in 2016, and Rohrabacher's (CA-48) unique liabilities involving his admiration for Russia 10 combined with the shifting politics of his district imperil him as well; “shifting politics” also describes the seat held by Walters (CA-45). On paper, Democrats should have a great chance to defeat Valadao (CA-21) in a majority Hispanic district that Clinton won by 16 points, but Valadao has won commanding victories in the high 50s in each of his three general election victories and it's not clear Democrats will have a strong challenger against him. Looming over all of the California seats is the state's top-two primary, which occasionally allows two members of the same party to advance to the general election. Democrats need to be sure they advance a candidate to November in all of these seats, which might require outside intervention given bloated Democratic candidate fields in some California races. One of the GOP advantages in this election is that they still have a number of proven incumbents running in Clinton-won districts, these half-dozen members included. Most of these members won relatively clear victories in 2016; the only one who didn't was Hurd (TX-23), who won by just a little over a point. Democrats will target all six of these districts, but it's unrealistic to expect them to win all of these seats: As we've noted previously, even big waves don't wash away all of the other side's most vulnerable incumbents 11, and a big wave is not guaranteed anyway. Realistically, winning half of these districts would represent a good night for Democrats. It's not entirely clear how vulnerable these three members actually are, although it seems like a safe bet that all three are in for much harder races than they are accustomed to. Lance (NJ-7) first won his seat in the big Democratic year of 2008 by eight points, and he hasn't really had a close general election since. Meanwhile, Culberson (TX-7) and Sessions (TX-32) never would have been considered as even remotely vulnerable until Clinton narrowly carried both of their suburban Dallas (Sessions) and Houston (Culberson) districts in 2016. Republicans seem about Culberson being caught napping, although he upped his fundraising output in 2017's fourth quarter, a sign that he may be coming around to his district's newfound competitiveness. Sessions, a former NRCC chairman, already was sitting on a big warchest and he's been adding to it. We're now transitioning into the part of the list where the Democratic targets are almost exclusively in Trump-won districts. With only 23 Clinton-district Republicans to target, and virtually no chance of sweeping those districts even under optimal national conditions, Democrats will need to win some Trump districts to win the House. How many? Read on. Both Bacon (NE-2) and Lewis (MN-2) were somewhat surprising Election Night winners in 2016: Lewis won an open seat while Bacon knocked off first-term Rep. Brad Ashford (D). The winning Republican margins in both seats were quite narrow: at both the presidential and House levels, the largest margin in either seat was Trump's 2.2-point win in NE-2, which prevented Clinton from getting an electoral vote from Nebraska (which, along with Maine, is one of two states that award electoral votes at both the statewide and congressional district levels). Adding to the intrigue in both districts is the likelihood that both will feature rematches: Ashford and 2016 MN-2 nominee Angie Craig (D) are the frontrunners for the nominations to face the first-term incumbents, although there is some grumbling in progressive circles that the Democrats should run different candidates 12. While the president's home base of New York City overwhelmingly rejected him outside of typically Republican Staten Island, Trump made big strides compared to recent Republican presidential performance in much of the rest of New York. He won six more congressional districts (nine of 27 total) across the state than Romney did in 2012 (just three). Much of New York outside of New York City is congressional battleground territory: As recently as 2010, Democrats controlled all but two of the state's districts, but now they hold only two-thirds (18 of 27). As in California, Democrats likely need to increase their already big majority in the state's congressional delegation in order to win the House, but the difference between California and New York is that in the former the Democrats have many Clinton-won districts to target, while in the Empire State the Democrats will have to win in Trump-won territory. Of the seven districts listed as potential Democratic targets, Clinton carried only one -- Katko's NY-24 -- and even then by a lot less than Barack Obama carried it (Obama won it by 16 in 2012, but Clinton only won it by four). Katko stands out as one of the few Clinton-district Republicans who currently lacks at least one clear Democratic challenger; Democrats were disappointed recently when former Syracuse Mayor Stephanie Miner (D) again ruled out a bid for the seat. The two clearest Democratic targets on this list are freshmen members Faso (NY-19) and Tenney (NY-22). A host of Democratic challengers is angling to face Faso, while Tenney is likely to face state Assemblyman Anthony Brindisi (D), who previously rebuffed Democratic entreaties to run before jumping in this cycle. The others are all basically reaches, although Zeldin's Suffolk County seat (NY-1) has historically been very competitive. Democrats held all four of these seats as recently as 2012, but in recent years all have fallen to Republicans. Retirements by long-time Democratic members helped Poliquin (ME-2) and Love (UT-4) to win competitive races in 2014, and both were reelected in 2016 with increased margins in rematches against their 2014 opponents. Barr (KY-6) knocked off then-Rep. Ben Chandler (D) in a Lexington-based seat in 2012, and Bost's (IL-12) larger-than-expected 2014 victory against a first-term incumbent perhaps presaged this downstate district's more than 15-point swing in margin from Obama in 2012 to Trump in 2016. Three of these four seats (all but ME-2, where there are several Democrats running but no obvious frontrunner) feature candidates touted by national Democrats: Salt Lake County Mayor Ben McAdams (UT-4), St. Clair County State's Attorney Brendan Kelly (IL-12), and Lexington Mayor Jim Gray (KY-6). Gray will still face a primary against veteran Navy pilot Amy McGrath (D) 13, whose debut ad went viral online and allowed her to raise a substantial amount of money. Few states swung harder against the Democrats in 2016 than Iowa, which Trump won by nearly 10 points after the state had generally voted at least a little more Democratic than the nation as a whole since the 1980s. Republicans now hold three of the state's four House districts. There have been some signs of slippage for Republicans in the state, though. A Des Moines Register poll pegged Trump's statewide approval among all adults at 35% as of early December 14 and Gallup had it at 43% over the course of 2017 15, also among Iowa adults. Even if one assumes Trump's standing is better among registered voters, it's still fairly weak statewide given Trump's 2016 showing. Iowa, one of the whitest states in the country, provides a great test as to whether Democrats can restore some of their performance among whites who do not have a four-year college degree. The Democrats' troubles in Iowa pre-date Trump, though: Sen. Joni Ernst (R-IA) won by a bigger-than-expected margin in 2014, the same year Blum (IA-1) and Young (IA-3) first won open-seat House races in districts that would flip from Obama to Trump in 2016. Kansas does not seem like the kind of state where Democrats could win a House seat, and yet they have two different but equally compelling opportunities in 2018. One of them is an open seat, KS-2, that is strongly Republican but which ex-Rep. Nancy Boyda (D) captured in a big 2006 upset. Boyda lost it two years later to Rep. Lynn Jenkins (R), who is now retiring, and 2014 gubernatorial nominee Paul Davis (D) is trying to replicate Boyda's success a dozen years later. The other district, Yoder's KS-3, was won by Clinton in 2016 even as Yoder won a competitive but clear reelection. A Democratic win in one of these districts would likely be seen as an upset, but to build a majority on this map, Democrats are going to have to spring some victories that would seem surprising this far in advance. Here is a grab bag of seats across three states: The only one rated as even Leans Republican is Taylor's VA-2, a GOP-leaning Hampton Roads-based swing seat. Unless there is a big wave, the Republicans should be fine in most if not all of these seats, but Democrats probably need at least one of these races to truly activate in the fall. The best possibilities at the moment may be VA-2; NC-13, where philanthropist Kathy Manning (D) is raising an impressive amount of money against the first-termer Budd; or perhaps OH-1, where Chabot just drew a potentially credible challenger 16 in Hamilton County (Cincinnati) Clerk of Courts Aftab Pureval (D). To be clear, this provides only a very loose blueprint of what a Democratic path to the House majority might look like. These are not predictions in individual seats. Republicans flip the open MN-1. All else remains the same, and the House is 218-217 when the 116th Congress opens next January, based on this scenario. It's unlikely that whatever the majority is next year will be so narrow, but it could be very close either way, akin to the Republican majorities following the 1998 and 2000 elections, when the GOP only held a little more than 220 seats in each Congress. But that said, what would this narrowest of Democratic majorities entail? Currently, there are 23 Clinton-district Republicans and 12 Trump-district Democrats. That would be reduced to 11 Trump-district Democrats to account, first, for MN-1. Of the 25 net seats the Democrats would gain, about half would come from the Clinton-district column (13), and about half from the Trump-district column (12). Democrats would thus control 23 Trump-won seats, while Republicans would control just 10 Clinton-won seats. The total number of so-called “crossover” seats would remain largely unchanged, going from 35 total down to 33 total, although the makeup of those seats would change substantially. One can see how important the Northeast and California looms in these projections: More than half of the projected Democratic pickups come from just four states: California (five), New Jersey (three), New York (two), and Pennsylvania (three). Table 1 shows our current House ratings, which readers can compare to the hypothetical path we've assembled and suggest seats listed (or not listed) that we have omitted from the path above. In all likelihood, if the Democrats do in fact win the House, there are some districts we currently have rated Likely or even Safe Republican that will become highly competitive by the fall. Based on the changes we're suggesting, Democrats would win every Safe Democratic seat (175 seats, not listed in the table), and Republicans would win every Safe Republican seat (176, also not listed). Democrats, again under this hypothetical projection, would win every seat currently rated Likely or Leans Democratic, a group that includes four seats currently held by Republicans. The Republican losses would come almost exclusively from seats rated currently as Toss-ups or Leans Republican. Under this scenario, Democrats would carry 14 of the 19 Toss-ups (a group that includes 16 current Republican seats and three Democratic ones). They also would carry eight of 20 Leans Republican seats and one Likely Republican seat. If this seems too rosy for Democrats -- if you don't believe that they can win seats in, say, Iowa or Kansas, or if you think that the Clinton-won Republican seats in places like California and Texas represent a mirage for Democrats -- then you probably think the Republicans are better than 50-50 to hold the House. If, on the other hand, you think that the Democrats can do better in the individual groups of seats spelled out above than the baselines we've set, then you might think Democrats can net 30 seats or more to build a more solid majority. Both possibilities -- Republicans holding the House, or Democrats winning it and not just by a few seats -- are in play. One final thought, which might comfort Democrats: It seems highly likely that there will be at least one more, and perhaps several more, key retirements from swing seats that move ratings in the Democrats' favor. Again, we just had two more over the last week: Republicans Frelinghuysen (NJ-11) and Meehan (PA-7). The more retirements there are, the fewer incumbent-held seats listed above are required to flip the House, and the better the Democrats' chances become.